In honor of last Sunday’s Oscars, here’s a movie that should be honored at next year’s ceremony (but, given that Sandra Bullock just won Best Actress for Blind Side, clearly won’t be). 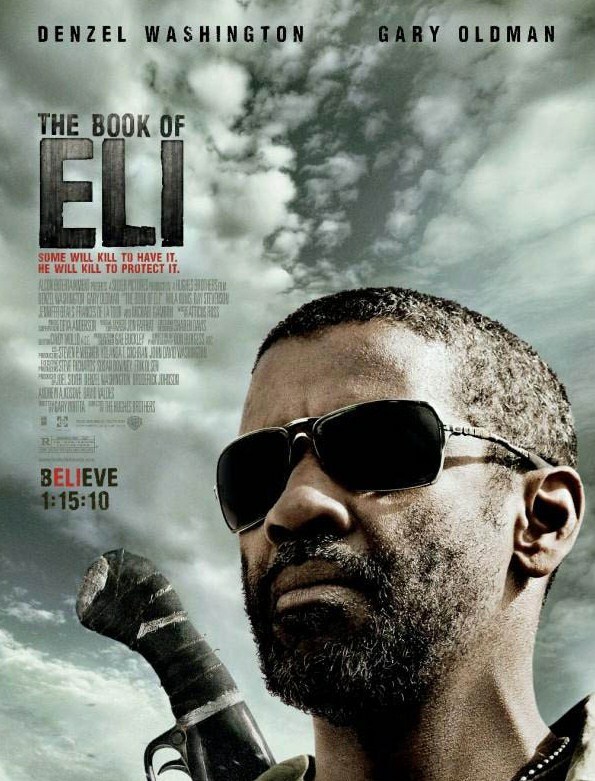 I had no designs of liking The Book of Eli—none. Due to an uninspiring trailer and tepid reviews, the only thing compelling me to a viewing was the presence of Denzel Washington and Gary Oldman plus some winter-inspired malaise. I walked out as stunned as I’d been by a movie in years; it’s not my favorite film since the summer of 2007, but not since the third Bourne have I wanted to do nothing but sit in contemplation of a film so much afterwards. Directed by the Hughes brothers, with whom I was unfamiliar, Eli is set in a post-apocalyptic world decades after a ‘flash’ wiped out civilized societies and many defining pieces of culture. Eli (Washington) stalks around forests hunting feral cats for food, feeding pieces to rats, perhaps because they’re the only companionship he has. The visually stimulating world realized by the Hughes brothers paints life in desert-like grays and dark greens, with remnants of the apocalypse still manifest in unmoved wrecked cars and bodies hanging from a noose in closets. There are some aspects of graphic novels (especially with the visuals and Eli’s extreme fighting skills) and western themes, but The Book of Eli proceeds in a rather straightforward manner. Eli steadfastly pursues an undefined course—heading West—and eventually comes upon an abridged version of a town lorded over by Oldman’s Carnegie. Carnegie’s pursuit of the last remaining copy of the Bible stems from a hope to use it as a persuasive force to expand his reign and justify his dominance. When he finds out that Eli is carrying said book with him, he tries to lure him over to his side, but Eli wants nothing other than to keep heading West. He seems to have a strange sort of protection over him, but that doesn’t prevent Carnegie from chasing after him when he calmly escapes the town. This well-paced film plays out more cogently and philosophically than I ever imagined it would. Washington and Oldman are both as good as ever, but the film has so many other things going for it that it leaves them behind—they’re almost ancillary. I noticed numerous parallels to 2006’s Children of Men, notably with a lead protagonist fighting to secure the human race’s last hope amid apocalyptic anarchy and chaos. And Eli finds nearly as much warmth and humanity as did Alfonso Cuaron’s masterpiece. The movie may seem overtly religious, but it emphasizes the distinction between people like Eli and those who want to use religion without really knowing what it means or just to convince people that what they’re doing is right. Carnegie’s feverish pursuit of what he unashamedly calls a weapon should give the film an immediate resonance for viewers. And, while the power of religious texts is promoted, note that the Bible is placed as just one book amidst others, and amidst other works of art and culture, at Eli’s final destination. The real religious undertones come not so much via the promotion of one particular faith, but rather the underlying themes: blessed are the poor and meek and injured (as we ultimately come to learn of Eli); do more to others than you do for yourself; and never be blinded so much by ideals that you can’t see the commonsense right thing to do. The most important of these concepts, though, shows that death is preferable to a life of misery and immorality. Rebuilding societies isn’t always a good thing, Eli tells us, as it’s not hard to see that we’d rather have not survived the apocalypse than to live in Carnegie’s town. These ideas are put forth via intense violence and conversational quiet, with a series of perfectly executed scenes that show us details of the world: the way people look for ‘shakes’ in someone’s hands to reveal cannibalism; the association that forms between street beggars/prostitutes and gangs; and the methods of survival practiced by an old couple living without a neighboring house for miles. The shootout that takes place there is fantastically filmed, in sharp contrast to the chaotic presentation of most such scenes; the Hughes brothers provide an incredibly long take, going at least two minutes without a cut (another Children of Men similarity), during which the camera zooms from the attackers into an open window like a missile and curves around to show the devastation inside. Reluctantly, Eli acquires a travelling companion in the form of Solara (Mila Kunis, better than most actresses in such roles, which is to say inoffensive), the prettiest girl in Carnegie’s town. Eager to get away from Carnegie’s oppressive rule of her and her blind mother (Jennifer Beals), she weasels her way into Eli’s care. Her escape from a car of Carnegie’s men is a little hard to fathom, I’ll grant, and the script seems to introduce an annoying plot hole by saying that Carnegie’s car lacks gas. Solara’s seems capable of driving for hours, but this could have been easily avoided by Carnegie preferring to just go back to open the book, so it doesn’t really harm anything. All told, I love a film that doesn’t bother to explain everything right off the bat as though you’re a little child. I love one that proclaims the power of books (and you’d think more would, considering how films and literature share almost all the same properties). And the twist both floored me and validated a suspicion I had from about the five-minute mark on—it’s guessable, but not obvious, and it makes everything that came before seem more interesting, not less. Just one of the many accomplishments in this strongly underrated film.